So you’re thinking about learning to ski? Well although Norfolk is said to be a flat county, we are very lucky to have a fantastic variety of ski slopes on Trowse Mountain. 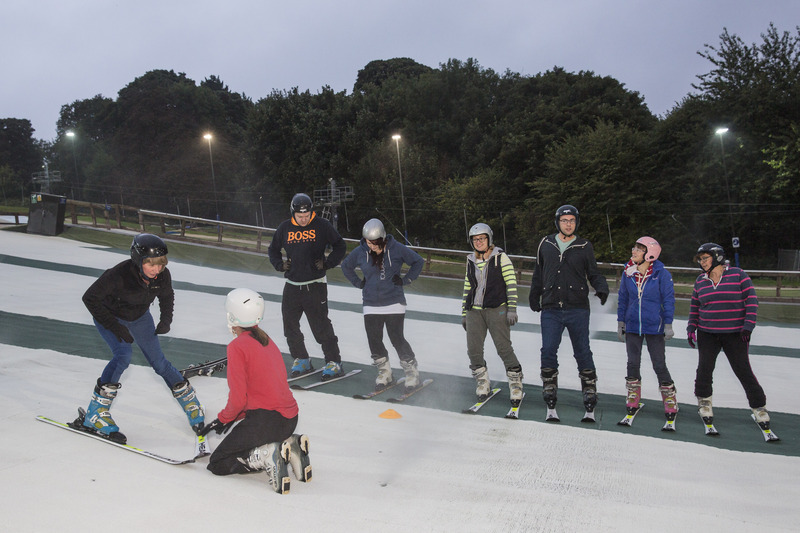 Learning to ski here, on the outskirts of Norwich, could take you from a complete beginner to a racer, free-styler, or even an instructor in less time than you may think! Our qualified instructors will help you along the way, from getting used to your equipment to advising on different techniques to help you improve. 6 hours covers our adult beginner’s course which will give you the confidence on snow to link basic plough turns or even just give you a brand new skill you’ll find yourself tempted to improve on. The cost for our 6 hour course is £75pp. We run a 4 hour beginner’s course for juniors held on Saturdays from 12:30-1:30pm. Once this course has been completed and our instructors feel the student is ready, the follow-on course is called Continuation and runs for another 4 weeks, this time from 2:15-3:15pm which introduces the children to different techniques as well as the main slope including the lift. The cost for the beginner’s course is £50pp and then the continuation is the same, or £40pp if you join as a member. The Polar Bears courses are incredibly popular and involve introducing the youngsters to wearing heavy boots and sliding around on their skis. The session is designed to promote the exciting side of the sport and so finishes each week with some tubing and the children can get stickers for their special cards in order to encourage them to persevere. The cost for this course is £40 for the four week block. Just how fit do you have to be, we hear you ask? Well, if you walk or exercise for at least 30 minutes each day, then you should be able to cope with one of our sessions with ease and our instructors tailor all lessons to fit with you, the customer. If you are keen to learn but are concerned about your fitness, we will always do our best to encourage you and stick to a level you are comfortable with. So when will you be able to ski from the top? Once you have completed your beginner’s lessons, you then have the option to join the Club and attend our supervised sessions. This is where our instructors help you ski with confidence, progressing from the nursery slope onto the main and making you look great and feel ready enough to book your first ‘snow’ holiday. You can also then look to join our various coaching sessions such as Fast-Track to Parallel, Junior, Ladies or Masters Clubs or the Race and Freestyle Coaching in order to improve you further and get you bombing down the big slope with the air of confidence one would expect of an expert on the slopes! Please see our Improver Ski page for more information on continuing your learning pathway. These courses will NOT have any follow on lessons available automatically, but are intended to simply introduce the 5 year olds to the slope and to encourage them to have fun!